The other day, I met a fellow watch nerd for lunch. Of course, we brought along various goodies over which we could geek out between courses, and among his was a Ferro Distinct single hand watch. I had featured Ferro when they were finalizing their design and when they first launched on Kickstarter, but hadn't had the chance to sample one in person. It is an impressive piece. I particularly liked the case, a big unit, 44mm wide and over 11mm thick with a soft curve to its outer edge and wire lugs that gave it the look and feel of a vintage pocket watch. 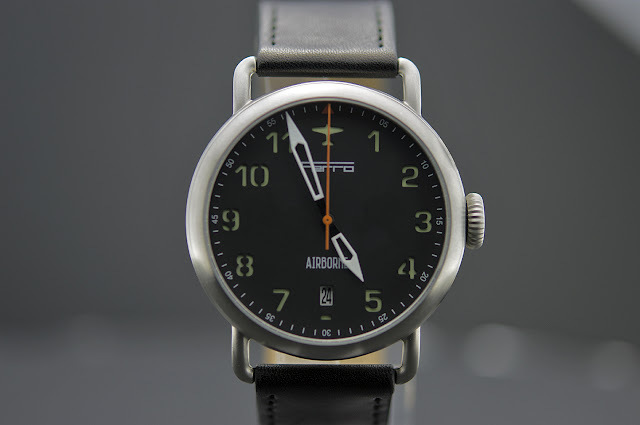 That night, I saw that Ferro had announced the launch of a new model, the Airborne. Serendipity is a funny thing. 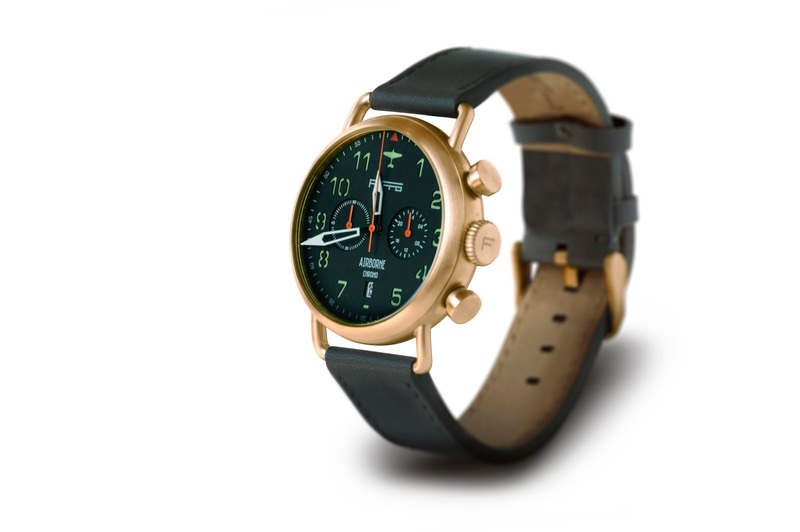 The Airborne's case appears nearly identical to that of the Distinct, but this time buyers can choose between titanium and copper. 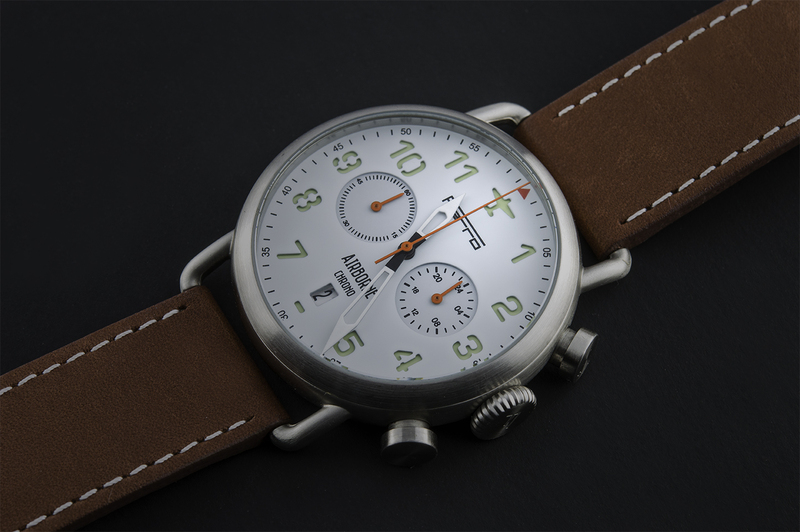 Titanium is not a common material for a watch case, but it is hardly unheard of. 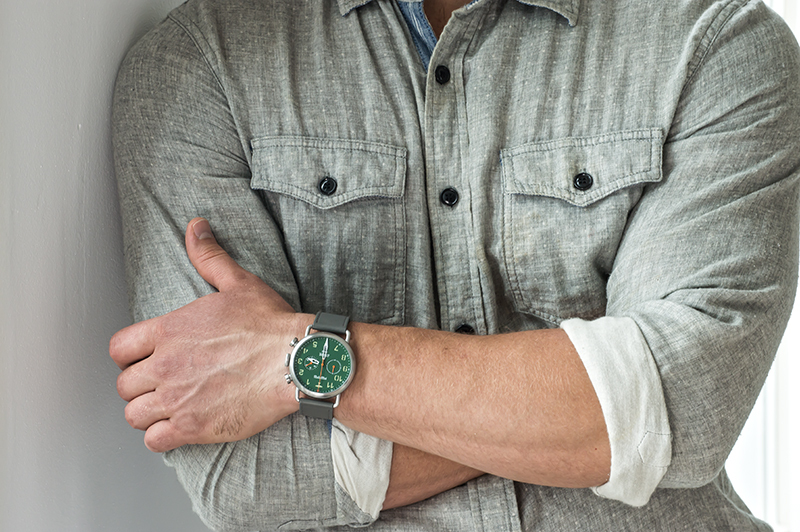 Many watches have been constructed from this strong, lightweight, and hypoallergenic metal. They generally have a gray color and matte finish that lends a tough, industrial quality. Note that the pictured prototypes are matte stainless steel, so there may be differences in color and finish between them and the final product. Cool as titanium may be, I am far more excited about the copper option. Copper, as everyone knows, has a distinctive red hue and can oxidize like crazy, developing a patina ranging from a mottled red and brown to a Statue of Liberty verdigris in no time. Copper is the major component of bronze and brass alloys, and there is certainly no shortage for those watches out there, but while I can think of several models that used a copper IP coating, I am hard pressed to identify more than one or two that used copper metal as case or bezel material. 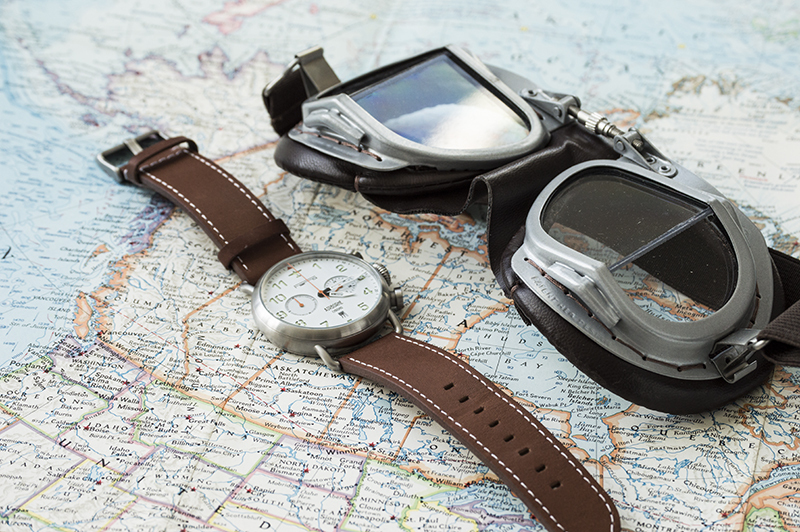 As you can see, the Airborne is a chronograph. The movement is the Seiko VK64 MechaQuartz, a unit that seems to be the new favorite among micro brands, and for good reason. Unlike other quartz chronos, the MechaQuartz engages a mechanical module for its speed timing functions, which provides a smooth, precise 1/5th-second sweep and crisp snap-back on reset. The movement is controlled by two buttons, similar in size and shape to the crown. They look big in the pictures but proportionate to the case. Ferro detoured a bit from the traditional pilot's watch face. 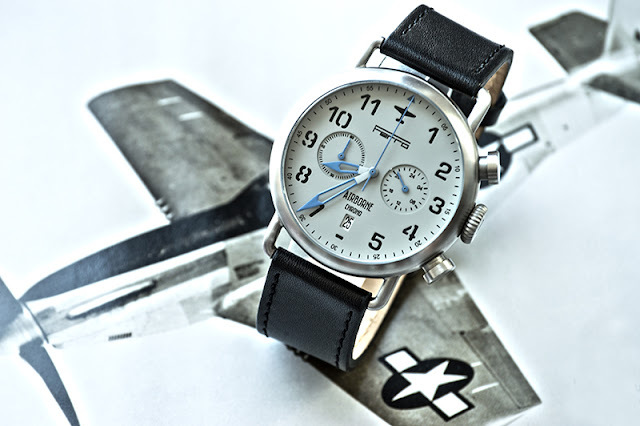 They resisted the urge to use the familiar flieger design and instead went for a sandwich dial with stencil-style, cutaway numbers and an aircraft silhouette at 12 o'clock. The big dial provides ample room for the two registers and the brand and model names at the top and bottom. The hands are skeletonized swords that are long enough to reach the markers. The smaller hands are a contrasting accent color, as is the small triangle at the top of the index. Dial colors are black, green, or while with a luminescent layer, or gray with cool blue hands and a non-luminescent black layer. Many pilot's watches have relatively low water resistance, but the Ferro is not among them. Its 100 meter rating should be more than sufficient, even if you find yourself in the unenviable position of a water landing. The watch also features a sapphire crystal. Ferro has already fully funded this project and the earliest of early bird discounts are gone, but you can still pre-order one for as low as $198 USD. See the Ferro Airborne Kickstarter page for more information. Update 8/25/15: Ferro has now added a three-hand automatic powered by a Miyota 8215 with pre-orders starting at $198. See photo below.